Techniques in neuroimaging such as functional magnetic resonance imaging (fMRI) have helped to provide insights into the role of supraspinal mechanisms in pain perception. This review focuses on studies that have applied fMRI in an attempt to gain a better understanding of the mechanisms involved in the processing of pain associated with fibromyalgia. This article provides an overview of the nociceptive system as it functions normally, reviews functional brain imaging methods, and integrates the existing literature utilizing fMRI to study central pain mechanisms in fibromyalgia. Fibromyalgia (FM) affects six to ten million Americans,  and the incidence is estimated to be one to four percent in the general population . The symptoms associated with FM significantly affect patients' quality of life  and can lead to extensive use of health care services . Fibromyalgia is experienced as a chronic, widespread pain condition accompanied by fatigue, tenderness, sleep disturbance, decrements in physical functioning, and disruptions in psychological functioning (for example, memory problems, diminished mental clarity, mood disturbances, and lack of well-being) [5, 6]. To date, a precise cause of FM is unknown. The diagnostic criteria for FM are, in part, based upon a demonstration of tenderness in 11 of 18 defined muscular sites . Recent evidence, however, suggests the tenderness is not confined to these sites in FM, but can be observed throughout the body, including non-muscular sites such as the thumb . The general and widespread nature of pain in fibromyalgia strongly suggests the involvement of central mechanisms that facilitate bodily spontaneous pain and that increase sensitivity to painful blunt pressure. These central mechanisms may involve spinal or supraspinal modulation of normal peripheral input, or efferent mechanisms that alter pain sensitivity at the periphery. These underlying central mechanisms of FM are likely to be reflected in altered supraspinal processing and may originate, in part, at supraspinal sites. The ability to evaluate human supraspinal processing has been enhanced greatly by major advances in brain imaging techniques. These methods vary in invasiveness, and in temporal and spatial resolution. These procedures evaluate neural activity from cerebral blood flow or glucose metabolism, neurochemistry from resonance spectroscopy techniques, changes in the volume of anatomical structures, and the amount of receptor binding by specific ligands. The focus of this paper is to describe the recent use of functional brain imaging techniques in studies of FM. It begins with a description of the nociceptive system as it functions normally, follows with an overview of functional brain imaging methods, and concludes with a synopsis of functional magnetic resonance imaging (fMRI) findings, shedding light on aberrant central mechanisms responsible for the pain of FM. The nociceptive system is a warning system of actual or imminent damage to the body. It is a self-contained sensory system composed of peripheral sensory fibers (primary afferents) connected to multiple spinal tracts and brain regions. Normally, relatively intense noxious stimuli are required to activate this system, a feature most likely associated with promoting, rather than hindering, adaptive behavior. Sensory fibers modulating pain sensations innervate all body tissues in order to respond to the most compelling dangers (for example, heat, cold, mechanical pressure, chemical, and metabolic stimuli such as low pH). These sensory fibers are composed of two types: thinly myelinated Aδ fibers and unmyelinated C fibers. Aδ fibers are rapidly conducting and transmit signals that produce perceptions of relatively sharp, incapacitating pain. Aδ pain has been referred to as 'first pain', consistent with its ability to rapidly warn and motivate avoidance of tissue-damaging stimuli. In contrast, C fiber afferents conduct more slowly and tend to produce perceptions of aching or burning pain referred to as 'second pain'. Second pain is diffuse, prolonged and aversive, and is the main component of pain associated with chronic medical conditions . Nociceptor afferents enter the spinal cord via the dorsal roots and terminate in lamina I, II, and V of the superficial dorsal horn. Activity in these nociceptors releases excitatory neurotransmitters at their terminals that activate secondary projection neurons. Excitatory transmitters include glutamate, which activates post-synaptic N-methyl-D-aspartate receptors, Substance P, and neurokinin A, which in turn activate post-synaptic neurokinin A receptors. Neurons in lamina I and II respond to specific noxious stimuli within small receptive fields (for example, in muscle or joint). These second order neurons are termed 'nociceptive-specific' and are dominated by Aδ fiber input. Nociceptive neurons in lamina V respond to both noxious and non-noxious mechanical stimuli and are termed 'wide dynamic range' neurons. The secondary neurons originating within the dorsal horn ascend in three primary contralateral tracts projecting to the thalamus and reticular formation. The largest tract is the spinothalamic tract, providing nociceptive information to thalamic nuclei  as well as to the primary (SI) and secondary (SII) somatosensory cortices. SI and SII are cortical regions believed to be involved in sensory-discriminative aspects of pain as well as in the anticipation of painful stimuli . Spinothalamic tract projections also facilitate nociceptive input to the insular cortex (IC), which has interconnections with the amygdala, prefrontal cortex (PFC), and anterior cingulate cortex (ACC). These regions form a network involved in affective, cognitive, and autonomic responses to nociception. Two of these regions (IC and PFC cortices) may also integrate nociceptive signals with memory of previous events, thus providing meaning and the identification of potential threats associated with painful stimuli [12, 13]. In addition to the spinothalamic tract, there are at least two other prominent ascending pathways from the spinal cord to the brain [14–17]. Like aspects of the spinothalamic tract, both of these pathways are thought to mediate the interactions between nociceptive signals, cognition, and emotional responses. 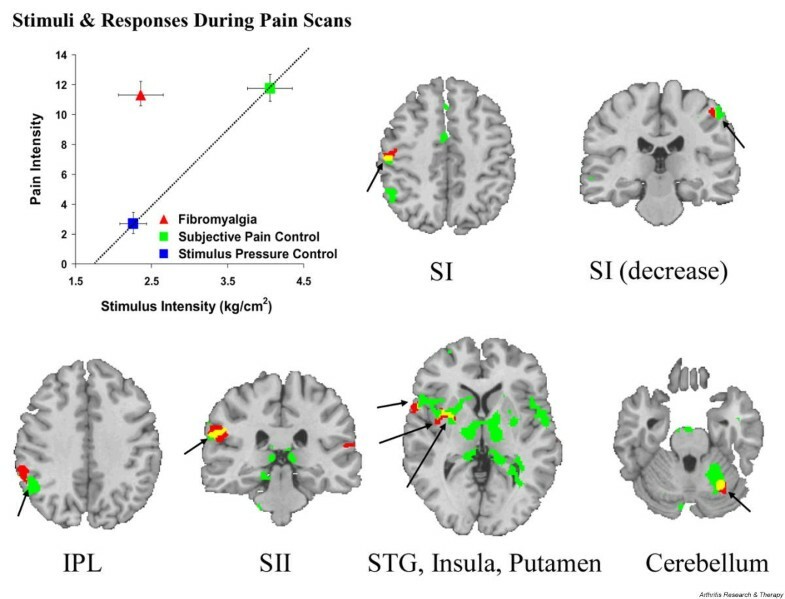 Consistent with the above, a meta-analytic review of acute pain neuroimaging studies suggested that the six most commonly activated brain regions for pain in healthy subjects were SI, SII, IC, ACC, PFC and thalamus . Interestingly, simply the anticipation of pain activates similar regions (PFC, anterior insula, ACC). These regions are involved in the formation of cognitive and affective representations of pain involving memories of past events and understandings of the present and future implications of events signaled by pain . Chronic pain states on the other hand have been more difficult to study; but summary impressions suggest that relative to acute pain processing, chronic pain processing reflects decreased sensory processing (for example, SI, SII) in favor of enhanced activation of regions associated with cognitive, emotional, and introspective processing of events . Several neuroimaging methodologies exist, each providing a slightly different temporal window for understanding the central processing of pain. The assessment of temporal characteristics is best performed through the use of the electroencephalogram or with the more advanced application of magnetoencephalography, which offers the ability to record the timing of brain events on the order of milliseconds. These methods are best used with stimuli having temporally precise onsets, such as provided by electrical, laser and acoustic sources, or by well controlled mechanical stimulation. These methods have not been very useful for stimuli that do not have such characteristics, such as the blunt pressure used in the assessment of tenderness in FM. While good for assessing temporal characteristics, the spatial resolution of these methods is relatively poor in comparison to other methods and is aided by the use of the modalities described below. Assessment of spatial characteristics often uses methods that do not measure neural activity directly but, instead, use specialized equipment to infer neural activity from highly localized increases in regional cerebral blood flow (rCBF) occurring in response to anticipated neural metabolic demand. The local increase in rCBF can be imaged by infusion of radioactive tracers with methods such as single photon emission computed tomography (SPECT) or positron emission tomography (PET). In the case of fMRI, the different magnetic properties of oxygenated and deoxygenated blood serve as an intrinsic tracer (that is, the blood oxygen level dependent (BOLD) fMRI signal). The various imaging methods differ in the ability to assess baseline rCBF, and in temporal and spatial resolution. One advantage of the early methods of SPECT and PET is that they could assess static rCBF; for example, comparing the baseline neural activity among different patient populations. Relative disadvantages were the need to infuse radioactive tracers, and modest temporal and spatial resolution. The time needed for a single image of the entire brain was approximately 30 minutes with SPECT, 1 minute with PET, and 2 seconds with fMRI. Localization also improves accordingly; fMRI methods now allow visualization of activity in discrete regions, such as thalamic nuclei, with resolutions as small as 1 to 2 mm. A potential disadvantage of the fMRI BOLD, however, is that such designs must repeatedly switch between stimulus 'on' and 'off' conditions, making imaging of static or long-lasting drug effects (for example, before and after treatment) more difficult. The pioneering application of brain functional imaging to patients with FM used the SPECT method. Mountz  used SPECT to evaluate baseline levels of rCBF in ten patients with fibromyalgia and in seven healthy control subjects. In this initial study, patients received infusions of approximately 25 mCi of 99mTc-HMPAO, a radioactive tracer that facilitated the imaging of rCBF. After the infusion, the subjects underwent a 32 minute SPECT scan. This method resulted in a semi-quantitative measure of rCBF with a resolution of about 8.5 mm. The analysis examined overall activity in large regions of interest corresponding to the right and left thalamus and the right and left head of the caudate nucleus. Results from this early study suggested that patients with FM had lower rCBF (that is, lower neural activity) than healthy control subjects during a quiescent resting state. Reduced neural activity was found both in the right and left thalamus and in the right and left caudate nucleus. Another group followed this initial investigation with a similar study. Kwiatek  used SPECT to assess resting rCBF in 17 patients with FM and in 22 healthy control subjects. These investigators observed decreased rCBF in the right thalamus, the inferior pontine tegementum and near the right lentiform nucleus but, unlike the initial study, no decreases in either the left thalamus or in the caudate nuclei were noted. The consistent finding of reduced rCBF in the right thalamus was also observed in a second study by the Mountz group , who examined the influence of historical factors on the SPECT results. These authors divided the sample of patients with fibromyalgia into those with a traumatic etiology (n = 11) and those with a more gradual onset (n = 21). Both patient groups, compared to 29 healthy controls, showed significantly decreased rCBF in the left and right thalamus. However, only patients with a gradual atraumatic etiology showed reduced rCBF in the left and right caudate. The findings of decreased rCBF in the thalamus and in the caudate nucleus are not unique to FM. Low rCBF has been observed in patients with pain due to traumatic peripheral neuropathy  and to metastatic breast cancer . Abnormally low rCBF levels in the caudate nucleus have been documented in patients with pain related to spinal cord injury , and in restless leg syndrome . The caudate nucleus receives a large nociceptive input from spinal pain pathways, including both nociceptive-specific neurons that signal the presence of pain, and wide-dynamic-range neurons that provide graded responses throughout the range of innocuous and painful stimulation [27–29]. The caudate nucleus may also be involved in intrinsic analgesia systems [30, 31]. Although the cause of thalamic and caudate decreases in rCBF is unknown, inhibition of activity in these regions is associated with, and may result from, prolonged excitatory nociceptive input . The present findings of lowered resting rCBF in these structures in FM patients are consistent with a mechanism of tonic inhibition maintained by persistent excitatory input associated with ongoing and spontaneous pain. That is, the widespread pain in FM is sufficient to activate pain inhibitory mechanisms, and one consequence of this inhibition is reduced resting and evoked activity in the thalamus. Before fMRI could be used to explore underlying pain mechanisms in FM, several methodological hurdles needed to be resolved. Unlike acute or surgical pain, where the nature and timing of the pain stimulus can be controlled, imaging FM pain is more challenging given that neither the experimenter nor the patient has the ability to systematically manipulate the characteristics of the condition . Thus, methodological advances for delivering and removing a standardized pain stimulus needed to be made that would permit: the rapid onset and off-set of the evoked-pain stimuli; the delivery of stimuli that were relatively unbiased by psychosocial factors; and the use of a pain stimulus that was meaningful and relevant to the condition of FM. Many studies of FM pain apply pressure to specific FM tender points. This is commonly done using 'ascending' testing methods, such as tender point counts or dolorimetry, where each subsequent stimulus is predictable in its intensity. These methods are easy to apply clinically, but can be influenced by response biases originating from both the subject and examiner. Improved methods that present stimuli in a random, unpredictable fashion (for example, Multiple Random Staircase) tend to minimize the influence of these factors . fMRI studies have the added methodological hurdle of needing to apply standardized pressure to regions of the body accessible during scanning and with methods that can be accommodated within the scanning environment. Thus, methods were devised that applied blunt pressure (1 cm diameter hard rubber probe) to the thumbnail. This site was chosen for the dense innervation of the thumb, and the large representation of the thumb in the primary somatosensory cortex. In addition, this site implicitly acknowledges that the tenderness observed in FM is not confined to classic tender points; tenderpoints, rather, are regions in which everyone is more tender and are thus more convenient for manual testing. The use of the thumb also implicitly implies that the tenderness observed in FM is neither due to muscle sensitivity nor confined to muscles but, rather, is a property of deep tissue, with the tenderness of FM being generally expressed over the entire body. Another extremely important methodological consideration addressed the fact that patients and controls differed not only with respect to the presence of clinical pain but also to the fact that the presence of concomitant clinical pain could alter their perception of the evoked pain stimuli. Thus, responses to stimuli needed to be evaluated in the context of equal stimulus intensities for patients and controls and under conditions of equal perceptual intensities. This approach permitted comparisons of neural activations between FM patients and normal controls associated with pain processing when either perceived pain intensity or stimulus intensities were constant. Using pressure-based Multiple Random Staircase to equate evoked pain perception between patients and normal controls, one of the first fMRI studies of FM applied blunt pressure to the left thumbnail bed of 16 right-handed patients with FM and 16 right-handed matched controls . Each FM patient underwent fMRI while moderately painful pressure was being applied. The functional activation patterns in FM patients were compared with patterns in normal controls. The results show that equal perceived pain intensity (achieved with significantly less pressure in the patients than controls), produced similar increases in neural activity in a network of brain structures implicated in pain processing (Figure 1). These increases were observed in structures involved in sensory discriminative processing (contralateral SI, SII), sensory association (contralateral superior temporal gyrus, inferior parietal lobule), motor responses (contralateral putamen and ipsilateral cerebellum) and affective processing (contralateral insula). Patients and controls also shared a similar region of decreased neural activation in the ipsilateral SI. Functional magnetic resonance imaging (fMRI) responses to painful pressure applied to the left thumb in patients with fibromyalgia and healthy control subjects. The top left graph shows mean pain rating plotted against stimulus intensity for the experimental conditions. In the 'patient' condition, a relatively low stimulus pressure (2.4 kg/cm2) produced a high pain level (11.30 ± 0.90), shown by the red triangle. In the 'stimulus pressure control' condition, shown by the blue square, administration of a similar stimulus pressure (2.33 kg/cm2) to control subjects produced a very low level of rated pain (3.05 ± 0.85). In the 'subjective pain control' condition, shown by the green square, administration of significantly greater stimulus pressures to the control subjects (4.16 kg/cm2) produced levels of pain (11.95 ± 0.94) similar to the levels produced in patients by lower stimulus pressures. The remainder of the figure shows common regions of activation in patients (red) and in the 'subjective pain control' condition (green), in which the effects of pressure applied to the left thumb sufficient to evoke a pain rating of 11 (moderate) is compared to the effects of innocuous pressure. Significant increases in the fMRI signal resulting from increases in regional cerebral blood flow are shown in standard space superimposed on an anatomical image of a standard brain (MEDx, Medical Numerics, Inc. 20410 Observation Drive, Suite 210, Germantown, Maryland 20876 USA). Images are shown in radiological view with the right brain shown on the left. Overlapping activations are shown by yellow. The similar pain intensities, produced by significantly less pressure in the patients, resulted in overlapping or adjacent activations in contralateral primary somatosensory cortex (SI), inferior parietal lobule (IPL), secondary somatosensory cortex (SII), superior temporal gyrus (STG), insula, putamen, and in ipsilateral cerebellum. The fMRI signal was significantly decreased in a common region in ipsilateral SI. Modified from Gracely and colleagues . In contrast to the extensive common activations observed in both patients and controls when subjective pain perception was equated, there were no common activations when the actual pressure stimulus intensity was equated. Applying a low stimulus pressure to both healthy controls and FM patients resulted in 13 regions showing statistically greater activation for patients (that is, contralateral SI, inferior parietal lobule, insula, ACC and posterior cingulate cortex; ipsilateral SII cortex; bilateral superior temporal gyrus, and cerebellum) whereas only one region (ipsilateral medial frontal gyrus) demonstrated greater activation in controls. These findings suggest that the greater perceived intensity of standardized low pressure stimuli by persons with FM is consistent with a model of centrally augmented pain processing. These results also suggest that the brain activations in patients and controls are consistent with their verbal reports of pain magnitude. In addition, these results demonstrate that, in the caudate nucleus and the thalamus, patients with FM showed reduced activation in comparison to controls. This lack of response is, at first glance, consistent with the finding of reduced basal activity in these structures [20–22]. However, it is important to note that the finding of basal levels could indicate either lack of evoked pain responsivity (inhibited system) or be responsible for increased pain sensitivity (greater response range; that is, activity can increase further before encountering a physiological 'ceiling'). Thus, this apparently consistent result is not necessarily expected and the implications of these results will depend on the results of further studies . The findings of the Gracely and colleagues  study have been supported by a second study using a contact heat stimulus. Cook and colleagues  showed that perceptually matched heat pain stimuli (that is, matched subjective perceptual pain ratings) applied to the left hand (evoked by less heat in patients (mean 47.4°C) versus controls (48.3°C)) resulted in similar brain activation patterns between a group of 9 female FM patients and 9 female healthy controls. In contrast, when evoked-pain stimuli were matched on actual stimulus intensity (that is, temperature), significantly greater activations in contralateral IC were seen in FM patients. In addition, these authors compared responses to non-painful heat stimuli, and observed that random warm stimuli between 34°C and 42°C evoked significantly greater activity in FM patients in bilateral PFC, supplemental motor areas, and in contralateral ACC. Hyperalgesia refers to a condition where normally noxious stimuli produce an exaggerated or prolonged pain response. In an attempt to image a hyperalgesic response to evoked pain, Grant and colleagues  used fMRI to compare the effects of multiple stimulus pressures delivered to the left thumb of 13 FM patients and 13 control subjects. During scanning, the subjects received 25 seconds of no pressure alternating with 25 seconds of pressure stimuli adjusted for each subject to produce: a non-painful touch sensation; painful pressure sensations rated as 'faint'; sensations rated as 'very mild'; and sensations rated between 'moderate' and 'slightly intense' pain. In each scan the subjects received each of the four stimulus pressures three times in a random sequence. Similar to the study described above , the amount of stimulus pressure needed to evoke the various subjective levels of pain was significantly lower in the patients; however, both patients and controls showed graded responses to stimulus pressure in regions involved in processing the sensory discriminative dimension of pain sensation, including contralateral (right) thalamus, SI and SII. Control subjects showed graded responses in right insula and anterior cingulate that were not found in the patients. These results indicate common sensory discriminative functions in both groups that occur with lower objective stimulus intensities for FM patients. The reduced affective response (that is, no activation in ACC or insula in FM patients) suggests that FM patients may not find the evoked pain stimulus affectively arousing due, possibly, to affective adaptation associated with their prolonged pain. Depressed mood often accompanies chronic pain, but depressed mood may not augment the sensory aspects of pain. Instead, mood may exert its own independent influence on pain processing. Giesecke and colleagues  conducted a study that evaluated the effect of symptoms of depression and/or clinically diagnosed major depressive disorder on pain processing in patients with FM. In this study, 30 patients with FM received fMRI scans during administration of painful blunt pressure to the left hand matched for equally perceived painful pressure. Symptoms of depression were measured with the Center for Epidemiological Studies Depression Scale (CES-D). Neither the extent of depression nor the presence of comorbid major depression modulated the sensory-discriminative aspects of pain processing (that is, localized imaging of sensory pain and reporting its level of intensity). However, symptoms of depression and the presence of major depressive disorder were associated with the magnitude of evoked-pain neuronal activations in brain regions associated with affective-motivational pain processing (that is, the bilateral amygdalae and contralateral anterior insula). These data suggest that there are parallel, somewhat independent neural pain-processing networks for sensory and affective pain elements. The implication for treatment is that addressing an individual's depression (for example, by prescribing an antidepressant medication that has no analgesic properties) will not necessarily have an impact on the sensory dimension of pain. Locus of control for pain refers to patients' perceptions about their personal ability to control pain. In studies of patients with chronic rheumatological pain conditions, a stronger belief in internal locus of control for pain has been associated with lower levels of physical and psychological symptoms, and better response to therapy [37–45]. In studies of patients with FM, internal locus of control has been associated with better affect, reduced symptom severity, and less disability in upper and lower extremity function  and generally improved levels of functional status . Most patients with FM, however, are more external in their locus of control compared to other rheumatological conditions or patients with chronic pain generally [46, 48, 49]. Several of these studies have concluded that increasing internal locus of control in patients with FM should increase the likelihood of improving function and decreasing impairment (for example, McCarberg and colleagues ). In a study designed to explore the neural substrates of locus of control, a sample of 20 females and 1 male meeting American College of Rheumatology criteria for FM were selected . Each patient received fMRI scans during administration of painful blunt pressure to the left hand matched for equally perceived painful pressure. Locus of pain control was assessed using the Beliefs in Pain Control Questionnaire . Results of this study found that stronger beliefs in an internal locus of control were significantly correlated with neuronal activations in the contralateral SII (r = 0.84, p < 0.05) in response to evoked pain. These results support the hypothesis that greater levels of internal locus of control are associated with greater magnitude of neuronal activation in this region associated with sensory discrimination and pain intensity encoding. Another common cognitive factor known to modulate pain reports is catastrophizing, an attributional style/behavior in which pain is characterized as awful, horrible and unbearable. Catastrophizing appears to play a substantial role in the development of pain chronicity. Burton and colleagues  found that catastrophizing accounted for over half (57%) of the variance in predicting the onset of a chronic pain condition from an acute pain event. Catastrophizing was once thought to be a symptom of depression but is now recognized as an independent factor that is only partially associated with depression. Catastrophizing has been suggested to augment pain perception via enhanced attention to painful stimuli and through heightened emotional responses to pain. This study hypothesized that catastrophizing would, therefore, influence activation of neural structures implicated in pain processing. Blunt pressure pain was applied to 29 FM patients while controlling for depression statistically. Independent of depression, catastrophizing modulated evoked-pain activity in a number of brain structures related to the anticipation of pain (contralateral medial frontal cortex, ipsilateral cerebellum), attention to pain (contralateral anterior cingulate gyrus, bilateral dorsolateral prefrontal cortex), and to both emotional (ipsilateral claustrum, interconnected to the amygdala) and motor (contralateral lentiform nuclei) responses . These findings suggest that pain catastrophizing exerts influence on pain processing that is independent of the influence of depression and supports the hypothesis that catastrophizing influences pain perception through altering attention and anticipation, and heightening emotional responses to pain. Like locus of control, therapies targeting the modification of catastrophizing might be useful in preventing the transition from acute to chronic pain in susceptible individuals. While cognition appears to modulate the experience of pain, it is also likely that pain interferes with the ability to think and process information. A well-known complaint of patients with FM is that of an overall impaired cognitive state that has been referred to as 'fibro fog'. The cognitive deficits observed in FM resemble those found in aging. For example, patients with FM tend to complete measures of working memory with a proficiency that is similar to healthy controls who are 20 years older [54, 55]. Neuroimaging studies of working memory in aged populations suggest that older subjects can show levels of performance that approach the levels of younger control subjects but must use relatively more cognitive resources. Bangert and colleagues  used fMRI to assess brain activity during a working memory task in 12 FM patients and 9 age and education-matched control subjects. The results show that both FM patients and healthy controls were able to achieve similar performances on the tasks. The imaging results, however, revealed that, in order to achieve this similar level of performance, FM patients needed to use far greater brain resources. FM patients showed more extensive neural activation in frontal and parietal regions, including bilateral activation in the middle frontal gyrus and right-side activation in medial frontal gyrus, superior parietal lobe, and precentral gyrus. These results support the hypothesis that FM patients show an aging effect that is using increasing cognitive resources to maintain comparable levels of performance as their same-aged peers. At the present time, functional brain imaging in FM has revealed the following insights. First, FM patients differ from healthy controls in baseline levels of neural activity, specifically in the caudate nucleus. Second, administration of a noxious pressure or heat stimulus results in changes in brain activity consistent with the verbal reports of patients' pain intensity. Third, like healthy controls, FM patients normally detect and experience a full range of perceived pain magnitude; but sensations become unpleasant at stimulus intensities that are significantly lower than those observed in healthy controls. Fourth, while commonly associated with chronic pain, depression does not appear to influence the sensory-discriminative dimension of pain in FM. Fifth, attitudes and beliefs such as locus of control and catastrophizing appear to be influential in the processing of sensory-discriminative aspects of pain. Sixth, FM patients utilize more extensive brain resources than do same-aged peers in order to achieve comparable performance on cognitive tasks. Currently, most fMRI activation studies can only assess the effects of short interventions that can be turned 'on' and 'off' repeatedly within seconds to a minute. Thus, conventional fMRI cannot directly assess the effect of an oral analgesic on the clinical pain of FM but can assess the interaction of the analgesic with a repeated brief stimulus such as painful heat or pressure. Newer MRI methodologies are changing this limitation and expanding the types of physiological variables that can be evaluated by functional brain imaging. Magnetic resonance perfusion can assess cerebral blood flow and cerebral blood volume, providing measures of baseline differences similar to that currently provided by PET. Diffusion tensor imaging, another variant of fMRI, provides a non-invasive, in vivo assessment of water molecular diffusion that reflects tissue configuration at a microscopic level in white matter regions. Quantification of water diffusion will improve the neuro-radiological assessment of a variety of gray and white matter disorders, including those involved in pain processing. Yet another new approach, magnetic resonance spectroscopy, obtains spectra of multiple selected regions and determines the ratio of concentrations of metabolites such as N-acetyl-aspartate, creatine, choline, lactate, glucose and glutamate. Usually, a particular stable metabolite (for example, creatine) is used as a standard and the concentration of the test metabolites are expressed as a ratio to this standard. Abnormalities in the levels of these metabolites are associated with a number of pathological changes in brain tissue. This method has been applied to patients with chronic low back pain, showing reductions of N-acetyl-aspartate and glucose in dorsolateral prefrontal cortex compared to control subjects . These recent applications of functional neuroimaging have provided evidence for a centralized pain augmentation in FM and identified brain regions that may be involved in this augmentation. Advances in design and new imaging technologies promise to further increase our understanding of the mechanisms that initiate and maintain this disorder, and can lead to improved diagnosis and treatment. = single photon emission computed tomography. Preparation of the manuscript was supported in part by Department of Army grant DAMD17-00-2-0018.